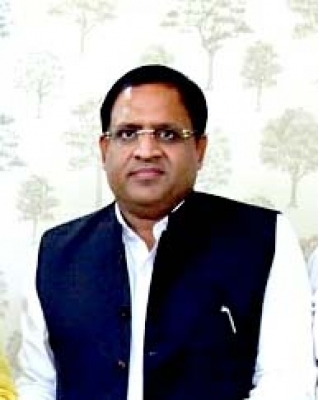 Chandigarh July 12 (IANS) The Haryana government is developing a global city over 1 000 acres area in Gurugram district adjjoining the national capital a minister said on Thursday. "This global city is poised to serve as an important node to Delhi-Mumbai Industrial Corridor (DMIC) sub-region of Haryana and carries an investment potential of $15 billion " Haryana Industries and Commerce Minister Vipul Goel told media here. He said that as a DMIC project initiative the Mass Rapid Transit System (MRTS) between Gurgaon-Manesar-Bawal over a length of about 82 km would be implemented as joint venture participation between Delhi Mumbai Industrial Corridor Development Corporation (DMICDC) and Haryana State Industrial Infrastructural Development Corporation(HSIIDC) with an investment of about Rs 17 328 crore. The project would be funded by Japan International Co-operation Agency (JICA) and has been included in the JICA Rolling Plan he added. Goel said that the 135 km long KMP (Kundli-Manesar-Palwal) expressway will be completed soon giving a boostA to commercial activity in the national capital region (NCR) area. "Another bright side to this project is that a Global Economic Corridor is proposed to be developed alongside the expressway and this economic corridor is estimated to have an investment potential of $50 billion. Manesar-Palwal section of this expressway which is 52.33 km long is already complete " he said. Gurugram district in Haryana adjoining Delhi has emerged a hubA for industrial and commercial activities including software corporate and technology companies.